For many years the football management simulation genre has been dominated by a certain title that needs no introduction. Its popularity is seemingly going from strength to strength. But that does not mean that there is not room in the market for other titles to carve out a niche, and one of the newest on the block is Title Challenge. 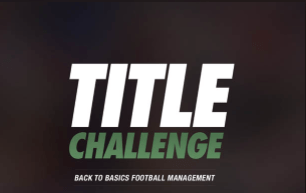 Whereas other titles have sought to be as ‘complete’ as possible, Title Challenge has taken a new direction, stripping back the game to a style reminiscent of the management sims of the 1990’s in what it calls “Back to basics football management”. The interface is stylish, with well-polished graphics, but is also simple to use. The intuitive controls will be picked up in no time by anyone already using Apple’s mobile operating system. For example, adjusting a formation is as simple as holding your finger on a player until he begins to ‘wobble’ and then shifting him to the desired position – much like rearranging the apps on the home screen of your iPhone or iPad. The game itself is also a fun and simple affair. As a manager you have control over your team’s formation and match day squad, be able to search for players to scout using an easy to use slider system, and transfer players at the tap of a button. Developing your team takes the mode of either investing in your training or scouting set-ups, or expanding your stadium, in order to get the best out of your club’s limited resources. The match day experience is where the influence of the 90’s is most evident. The match whizzes past in the form of text commentary, with access to your tactics screen only a click away at any time. You can choose from five league systems – England, France, Italy, Spain and Germany; all of which feature the respective lower tiers and real club names. One drawback is the absence of real player names, but with a bit of inspiration taken from the ISS pro series, the ‘close enough’ fake names mean any football fan will be able to decipher Daniel Sturridge from ‘D Stockdale’. The game also features a database editor that you can export to share with your friends. All in all the zippy pace the game moves at, coupled with the simple interface and clever autosave feature means Title Challenge is the perfect option to whittle away those long hours on the commute to work, waiting in line at the post office or relaxing in between games on a Saturday.